The cuckoo clock is a favorite souvenir of travelers in Germany, Austria, and Switzerland, and particularly the Black Forest region of Germany. The clock is prized for a number of its features. The outer worked wood case is usually made of beautiful dark wood that is intricately carved with folk and forest scenes. The clock itself is made in the premier clock-and watch-making area of the world. And, finally, there is the cuckoo and its fellows. On the hour (and often the half-and quarter-hour as well), the charming carved bird pops out of a door to sing the hour in a melodic "Cuckoo!Cuckoo!" call. He is often introduced or followed by a parade of townspeople, forest creatures, or other animals that circle through another door and seem to celebrate the passing of every hour and the timelessness of their carefully crafted clock home. The cuckoo clock known today is the most popular form of ornamental clock—one that is decorative as well as functional. When the tiny wood cuckoo emerges to call the hour, two small pipes attached to two miniature bellows make his call. The sets of pipe-and-bellows are mounted on either side of the clock with slots cut through the wood frame opposite the bellow vents to allow the sound to be heard. Inside the clock, a finely made set of brass clockworks controls the time-telling. Two weights shaped like pine cones that dangle from the ends of chains and a pendulum that is tipped with a leaf add to the traditional appearance, although these are only decorative on modern clocks that are spring-driven. The cuckoo clock has an impressive parent in the Black Forest clock. The provinces of Baden and Wuirttemburg (now the province of Baden-Wiirttemburg) lie deep in the Black Forest region of Germany. Winters there are long, dark, cold, and characterized by deep snowfalls. With forestry and agriculture limited during this season, a cottage industry in the production of clocks grew in the Black Forest. Glass-making was a traditional craft, and clock-making sprang indirectly from this when, in about 1640, a traveler introduced a simple Bohemian clock operated by three wheels on a train (continuous drive), a verge escapement (the device that allows the train to advance a controlled amount by restraining it with weights), and a foliot (a balance bar). The clock was not ornamented. The local citizens learned how to copy the clock and make the tools to craft it. They also worked together as a group with specialists in frame-making, manufacturing the clockworks, making and painting dials, brass founding, making chains and gongs, finishing metal parts, and performing many supporting tasks. The clockmaker made his own patterns and styles; parts for his clocks were unique and not interchangeable with other makers. By the late 1700s, the clocks were a profitable export for the region and were sold as far away as Russia. cones, and these were adapted to the wood-frame style later. Ketterer used the church organ pipe as the basis for the production of the cuckoo's sound, and his clock-making abilities were so skilled that the cuckoo clock became known for its reliability as a timepiece. The variety of cuckoo clocks reflects clock-making styles of the time. A clock dating from 1770 may have a painted face shield with roses and castles. This was the English style of the day, but was popularized throughout southern Germany and Central Europe; the same design appears on the sides of painted barges. Soon, the decoration was modified to suit the targeted market. For instance, the French liked large bouquets of bright flowers and called the cuckoo clocks "Swiss clocks" even though most were made in Germany. Scandinavians preferred hexagonal or octagonal faces, while the Dutch and Belgians liked tin or porcelain dials. In England, the clocks were called "Dutch" clocks (possibly from "Deutsche," meaning German), and they were simple mahogany rims with glasses held in place with brass bezels. By the mid-eighteenth century, cuckoo clocks moved from the peasant or cottage industry to factories. By 1850, a style called the "hunting lodge" or "chalet" style dominated; the frame shows a lodge at the base of the clock, the clock dial over the roof, and carved trees and animals rising above the dial to the top of the frame. In "The Cricket on the Hearth," author Charles Dickens describes a clock with the figure of a haymaker with a scythe who moves with the pendulum. One particular style called the "Surrerwerk" or whizzing work strikes with the sound of twelve blows like the sound of small hammers. Usually, the cuckoo clock had two drive trains, one for the clock movement and the other for the socalled striking train, or the sounds and actions produced with the striking of the hour. The movements became standardized in style, size, and materials. European movements are of brass and steel, and American movements are brass. The numerals on the dial are painted in German gothic style. Modern cuckoo clocks have retained the suspended pine-cone weights. Some large cuckoo clocks made at the end of the nineteenth century also housed barometers. Later clocks from about 1900 have wood frames, brass wheel works, and a wooden carved cuckoo on a sweeping stand that shifted forward to chime the hour. Inlaid wood has also been used to make cuckoo clocks, notably those from Northern Italy in the Ampezzo region. Late in the twentieth century, the cuckoo clock entered the digital age when manufacturers began equipping some models with quartz clocks that play twelve different tunes, one for each hour, and an automatic shutoff to silence the bird for a programmable number of hours during the night. Wood is the critical raw material for the manufacture of cuckoo clocks, because the wood casing is the primary feature that distinguishes the cuckoo clock in appearance. Cuckoo clocks are made from the wood of the linden tree, a hardwood that grows in Europe. Some parts of the housing may also be made of walnut. Skilled wood workers purchase the linden and walnut woods well in advance so the wood can be aged for two years. Depending on what the craftsman wants, it may be purchased in logs with the bark removed or in block-like lengths. The cuckoo clock is also distinguished by the cuckoo and its sounds. The pipes and bellows that make the cuckoo's call are also made of wood. Clocks that play tunes are fitted with music boxes. The music boxes and the mechanical movements for the clocks (as well as small parts like the clock's hands) are produced by specialized subcontractors. The lead pine cone weights and the leaf-shaped weight on the end of the pendulum are made of lead and are produced in metal foundries by pouring a melted lead alloy in tempered metal molds. The foundries that produce these weights are also experts in small, detailed metalwork. 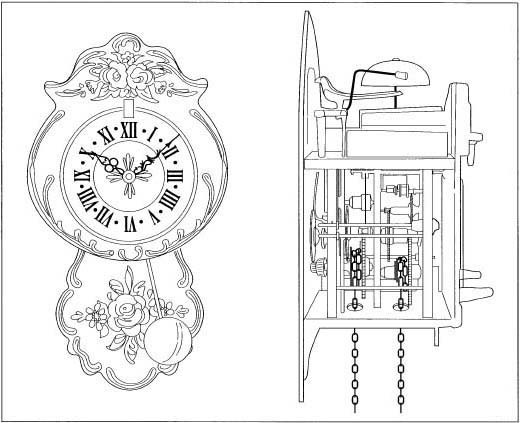 As the history of the cuckoo clock suggests, design of the clock and its highly recognizable parts is based on tradition. Clock manufacturers have developed their own styles of chalets and forest scenes for the wood work as well as particular "casts of characters" for the cuckoo bird itself and the villagers or animals that may share "action scenes" with the cuckoo. New lines or styles of clocks are not likely because customers buy cuckoo clocks for their traditional style. The addition of digital features increases the variety of music and bird songs that the clocks can produce, but clocks with digital enhancements have not yet proven to be more popular than traditional models. Manufacture of the cuckoo clock begins in the hands of the wood worker. The craftsman selects the pieces of wood to be used for the particular clock and cuts them to the approximate lengths and shapes he will need. Power tools and hand tools are used for this part of the process; hand tools may include measuring tools, saws, rasps, and files for shaping, drilling tools, abrasives including sandpaper, and adhesives and clamps. The box-like case or cabinet for the clock works is cut, fitted, and glued together. The outer frame—the decorative part of the clock featuring the traditional forest and chalet scene—begins with a stenciled design on paper. The craftsmen make and collect sets of stencils based on their own drawings and those that have been handed down. The sets of stencils are made for specific sizes of clocks. After choosing the stencil for the size and style of clock, the wood worker draws the design on the wood and begins carving and shaping the frame. When the frame and the case are complete, both are stained and left to dry. When the frame and case are dried, the clock is assembled by first mounting the movement in the case. In the old days of village manufacture, the craftsmen who carved the wood and assembled the clockworks probably lived in the same village. The clockmaker poured and handcrafted the internal workings of the clock himself and assembled them. Today, manufacturers buy preassembled clock movements, and the process is reduced to fitting it in the case and properly fixing it in place with wood screws or other fasteners. The sound-making devices are attached to the top of the clock. These include the pipes and bellows for the cuckoo sound and the music box. Attachments that are usually extensions of drive chains are linked to the sets of wire hooks and metal cams and pins that activate the cuckoo and any other moving figures and the doors. The cuckoo is connected to its bellows operation, and the other figures are mobilized by the strike movement. A third movement initiates the playing of the music box. Finally, the pendulum and weight chains are connected to the movement and the lead weights are clipped to the chain ends. The assembled clock is carefully packaged to protect the moving parts and the delicate carved framework. Individually boxed clocks are packed in cartons for shipping and distribution. Quality control consists of only two steps. Quality is built into every cuckoo clock because each one is hand made. Quality is the mark of the craftsman, and, as with all handcrafted products, gifted and highly trained wood workers will not risk their reputations on poorly made clocks. The final quality step is a complete examination of the finished piece and a trial operation. There are no byproducts from cuckoo clock manufacture, and waste is minimal. Some wood scraps and shavings result from crafting the case and carving the frame, but attentive selection of the right pieces of wood for the project and stencils that accentuate the character of the wood limit the volume of scrap. The wood is also too expensive for the wood workers to waste. New cuckoo clocks are still among of the most sought-after souvenirs of vacations in the heart of Europe and especially in Germany's Black Forest region. In America, many families can trace their roots to Germany, Austria, Switzerland, and other European localities where cuckoo clocks are traditional ornaments for the home. Consequently, there is a market in America for clocks that represent the best traditions of cuckoo-clock making. Cuckoo clocks are also highly prized antiques. Hand-crafted clocks with "provenance" (a traceable history) are sought by collectors, but antique hunters also search for factory-made cuckoo clocks. Those dating from the 1850s are highly sought based on the name of the maker; names like Gustav Becker, the United Freiburg Clock Factory (which Becker joined by 1900), Winterhalder & Hofmeier, Kienzle, Junghans, and the Hamburg American Clock Company (which copied American-made clocks for sales in Germany) are among the most collectible. Typically, the antique market also injects life into sales of newly manufactured collectibles because they are more affordable. Even though some models of cuckoo clocks are now ouffitted with quartz movements and electronics, part of the cuckoo clock's charm may be its old-fashioned mechanical movement. When paired with beautifully carved wood and rustic style, the spell of the cuckoo's song on the hour is guaranteed to bring smiles to those who prize childlike delights and exquisite craftsmanship for years to come. Bruton, Eric. The History of Clocks and Watches. New York: Rizzoli International Publications, Inc., 1979. Coggins, Frank W. Clocks: Construction, Maintenance & Repair. Blue Ridge Summit, PA: TAB Books, Inc., 1984. Fleet, Simon. Clocks. London: Octopus Books, Inc., 1972. Hunter, John. Clocks: An Illustrated History of Timepieces. New York: Crescent Books, 1991. Kadar, Wayne Louis. Clock Making for the Woodworker. Blue Ridge Summit, PA: TAB Books, Inc., 1984. Lloyd, H. Allan. The Complete Book of Old Clocks. New York: G. P. Putnam's Sons, 1964. Nicholls, Andrew. Clocks in Color. New York: Macmillan Publishing Co., Inc., 1975. Smith, Alan. The Antique Collector's Guides: Clocks and Watches. New York: Crescent Books, 1989. Tyler, E. J. European Clocks. New York: Hawthorne Books, Inc., 1969.